After the Yes vote - What happens next? When will the result of this weekend’s vote become official? It will take more than a week before the result of this weekend's referendum is signed by the President and the Taoiseach. On Monday, the returning officers will get the formal results from each constituency. These will be published in Iris Oifigiúil. After that there is a seven-day period where any citizen can lodge an objection to the result. If there are no such objections, the President of the High Court will write to the Taoiseach and the President to let them know there is no reason for them not to sign the result into law. Then, the President and the Taoiseach can sign-off on the result, making the constitutional change official. So once the constitution has been changed, is there an immediate change to the way women access abortion services in Ireland? No. The change in the constitution gives the Oireachtas the power to change the law, but that change has not yet happened. When will changes be introduced? The Government has already published the general scheme of a bill to regulate the termination of pregnancy. In the next fortnight the cabinet will formalise this, and substantive legislation will be prepared by the autumn for introduction into the Dáil. The Minister for Health has indicated that he wants this legislation passed before the end of the year. So what happens if a woman wants to access abortion services before the law is changed? The Protection of Life During Pregnancy Act which became law in 2013 will continue to govern the way in which terminations can occur until new legislation is introduced. This Act allows for a termination of pregnancy in instances where two medical practitioners have jointly certified that the woman’s life is at risk due to one of three scenarios: that there is a real and substantial risk of loss of the woman’s life from a physical illness; an immediate risk of loss of the woman’s life from a physical illness; or there is a real and substantial risk of loss of the woman’s life by way of suicide. Does a woman still have the right to travel or access information about abortion services abroad? Yes. The Protection of Life During Pregnancy Act, which currently governs abortion services, states that there are no limitations on the freedom to travel for an abortion, or to obtain information on abortion services abroad. What changes to the law are being proposed by the government? It proposes to legislate for abortion where there is a risk to the health as well as the life of the pregnant woman, with no distinction between the risks to physical or mental health of a woman. Two medical practitioners would be required to assess access to termination of pregnancy on the grounds of a health risk. In an emergency situation - where there is a health risk to the pregnant woman - it is proposed that one medical practitioner would terminate a pregnancy. The legislation would allow for the termination of pregnancy where a foetal condition is likely to lead to death before, or shortly after, birth. Two appropriate medical practitioners would be required to enable access to terminations in such circumstances. The bill would allow for termination of pregnancy in the first 12 weeks of gestation, "without specific indication". A time period of 72 hours would be required to elapse between the initial assessment by a medical practitioner and the termination of pregnancy being carried out. There would be no gestational time limit on the termination of a pregnancy for a foetal condition which is likely to lead to death before, or shortly after birth, or on maternal health grounds. The bill would require the Minister for Health to be notified about the termination of a pregnancy. An annual report will also be published on the terminations of pregnancy in the preceding year. A formal review process will be established to ensure timely access to termination of pregnancy services. The HSE would also be required to prepare a report each year of reviews undertaken the preceding year in defined circumstances. 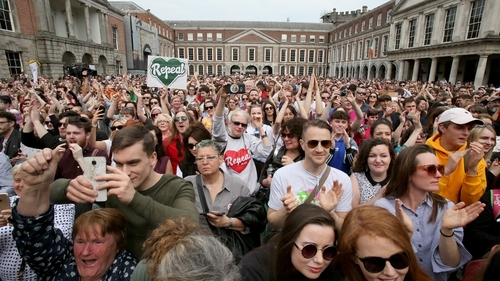 Similar to the Protection of Life During Pregnancy Bill introduced in 2013, any new legislation would allow for conscientious objection by medical professionals. The termination of pregnancy outside of the provisions of the new legislation would be unlawful. However, a pregnant woman who seeks to procure an abortion herself would not be criminalised. There would be a clause in the new legislation to state that nothing would limit or interfere with the right to travel or information. Will this legislation get through the Oireachtas? The legislation will be scrutinised by the Cabinet, the Oireachtas Health Committee, and the wider Dáil and Seanad before being voted on. Fianna Fáil and Fine Gael are allowing their TDs a free vote on the issue of abortion, Sinn Féin will decide its position on the legislation at a special Ard Fheis to be held next month, although we already know that just two of the party’s TDs are opposed to the proposals. With the strength of the Yes vote in the referendum, it seems likely, in the current Dáil, that the proposed legislation would pass.